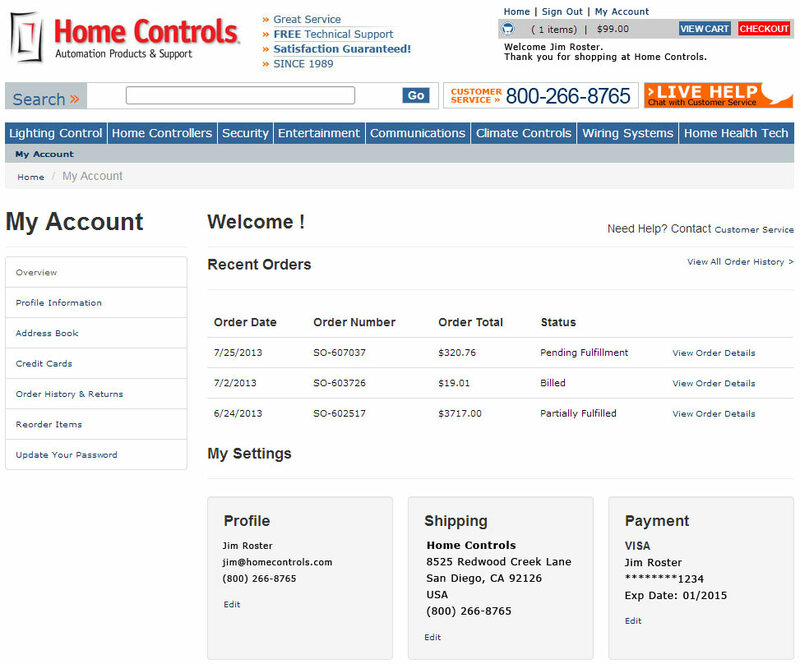 Home Controls has added a dynamic customer service center to our online store – called My Account – giving you access to your personal settings, order status, purchase history and more. Order History: You now have full access to your order history with details on every order. The order details page provides you with a summary of billing, shipping and payment information. Order Status & Package Tracking: For new and open orders, you can review each order’s status, including shipping information with tracking links. Re-Order: Quickly order previously purchased items from a single list. The Re-Order list contains all the products you’ve ever purchased from Home Controls, with several advanced sort features. Profile and Password: Manage your personal information, including your name, email, phone numbers and passwords. Address Book: Easily manage multiple shipping and billing addresses. You can even set your default shipping and billing addresses for faster checkouts. Credit Card Management: Securely store multiple credit cards for use during checkout.